The academy's page-long mission statement ends with: "The goal of The Academy is to prepare students for acting careers in theatre, television and film. Our purpose is to provide a practical, post-secondary education that emphasizes the skills needed by an actor in today's competitive environment." The oldest acting school in the English-speaking world, the Academy in New York City was founded in 1884 to train actors for the stage. Its first home was the original Lyceum Theatre on what is now Park Avenue South. In 1963, the school moved to its current home, a landmark building designed by the American Renaissance architect Stanford White for the Colony Club. In 1974, the Academy opened another campus in Pasadena, California, which made it the only professional actor training school in both major centers of American entertainment. The Los Angeles campus moved from Pasadena to Hollywood in 2001 in a new building next to the site of the former studios of Charlie Chaplin. The Academy remains dedicated to training professional actors. It offers a two-year program in which students have to be invited back for the second year. Auditions are held at the end of the second year for the third year company. As well as training for the theatre, it now offers courses in film and television, providing a structured, professionally-oriented program that stresses self-discovery, self-discipline and individuality. Students who graduate in New York receive an Associate of Occupational Studies degree; students who graduate in Hollywood receive a Certificate of Completion or an Associate of Arts degree in Acting. Students from New York and Los Angeles can get a Bachelor of Arts degree from selected universities. Numerous students of the Academy have gone on to distinguished careers throughout the entertainment industry, receiving nominations for Tonys, Oscars and Emmys. The Academy has many teachers and faculty who have many professional connections and credits. Notable faculty includes: David Dean Bottrell, Karen Hensel, Sandy Martin, Ian Ogilvy, and Scott Reiniger. ^ a b "Faculty Directory". American Academy of Dramatic Arts. 2019. Retrieved April 5, 2019. ^ a b "Executive Leadership & Staff Directory". American Academy of Dramatic Arts. 2019. Retrieved April 5, 2019. 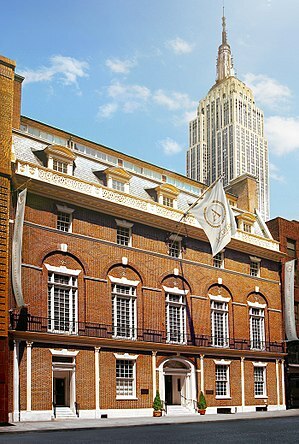 ^ "American Academy of Dramatic Arts–New York". Peterson's [college guide]. 2019. Retrieved April 5, 2019. ^ "American Academy of Dramatic Arts–Los Angeles". Peterson's [college guide]. 2019. Retrieved April 5, 2019. ^ Nemy, Enid (June 11, 1985). "Oldest acting school fetes its 100th birthday". New York Times. Retrieved September 1, 2012. ^ "History and Heritage". aada.edu. American Academy of Dramatic Arts. Retrieved 2 February 2016. ^ a b c d e f g h i j k l m n o p q r s t u v w x y z aa ab ac ad ae af ag ah ai aj ak al am an ao ap aq ar as at au av aw ax ay az ba bb bc bd be bf bg bh bi bj bk bl bm bn bo bp bq br bs bt bu bv bw bx by bz ca cb cc cd ce cf cg ch ci cj ck cl cm cn co cp cq cr cs ct cu cv cw cx cy cz da db dc dd de df dg dh di dj dk dl dm dn do dp dq dr ds dt du dv dw dx dy dz ea eb ec ed ee ef eg eh ei ej ek el em en eo ep eq er es et eu ev ew ex ey ez fa fb fc fd fe ff fg fh fi fj fk fl fm fn fo "Notable Past Students". Notable Alumni. American Academy of Dramatic Arts. Retrieved 7 June 2017. ^ Ward, Matthew (2015-01-26). "Former Miss Virginia from Suffolk dies". Suffolk News-Herald. Retrieved 2015-02-14. ^ Annual Catalogue, American Academy of Dramatic Arts and the Empire Theatre (1904): 73, 75. ^ Collins, Bob (2017-02-01). "Gwen Gillen was much more than the Mary Tyler Moore statue". Minnesota Public Radio. Retrieved 2017-02-27. ^ Themal, Harry F. “Raters Prune ‘Orange’: True to Hypocritical Oath.” The News Journal (Wilmington, DE). (September 25, 1972): p. 32. ^ Harry Prescott Hanaford, Dixie Hines, eds., Who's who in Music and Drama (H. P. Hanaford 1914): 311.